Britain's record signing Angel di Maria has moved into a hotel with his family following an attempted break-in at his Cheshire home. Angel Di Maria has been worried about his family's safety after an attempted break-in at his Cheshire home says Manchester United boss Louis van Gaal. Intruders failed to get in after triggering an alarm when they smashed a patio door at the 26-year-old's home. The winger, who cost a British transfer record £59.7m, has moved into a hotel. "He was worried about his wife and child," said Van Gaal. "I believe in the total human being principle. So his environment is important." Van Gaal spoke to Di Maria before United's FA Cup fourth-round replay win over Cambridge at Old Trafford to ensure he was in the right frame of mind to play. "I decided in the past never to play a player in those circumstances," added Van Gaal. "But with him, I had the feeling that I had to give him a chance to play and I was happy that I let him play." 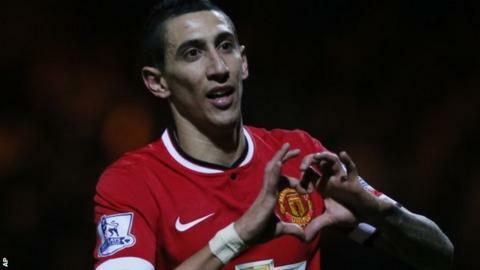 Van Gaal said he expects Di Maria to confirm he is willing to be involved in Sunday's Premier League trip to West Ham.